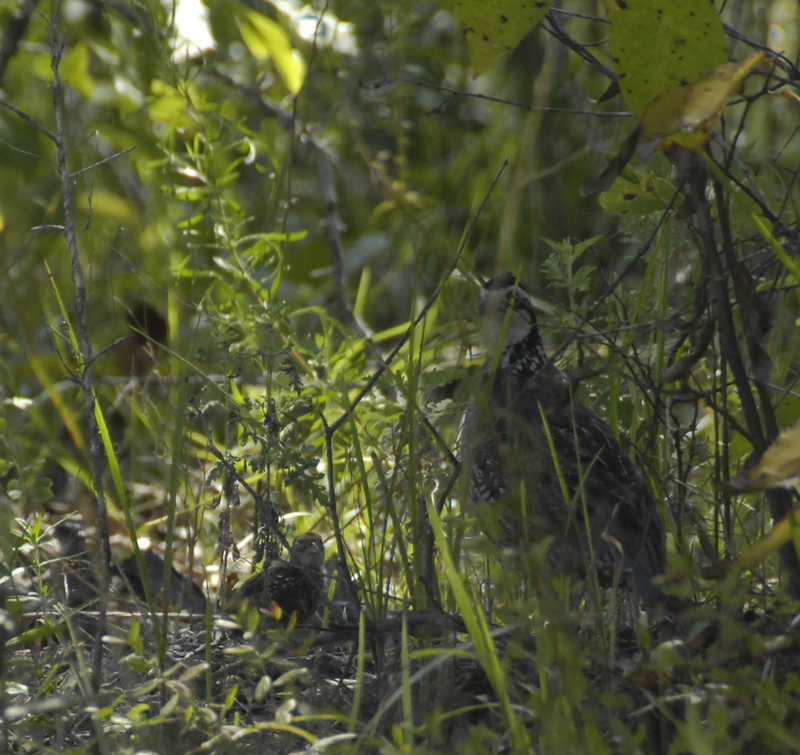 Yes, the photo last week was of a bobwhite quail and her chick, thinking they were hidden from me on the roadside. The Georgia DNR has some good Quail management information at this link. Last week, I visited Luke Johnson and he had a large tree in his yard. What is he pointing at in his tree? 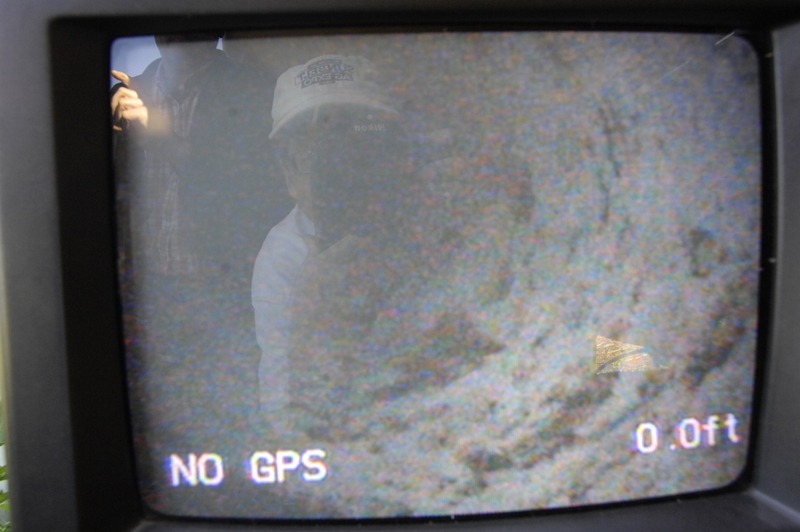 We’ve been looking down under the ground with the Extension Well Cam recently. We’ve looked into these wells for various reasons. 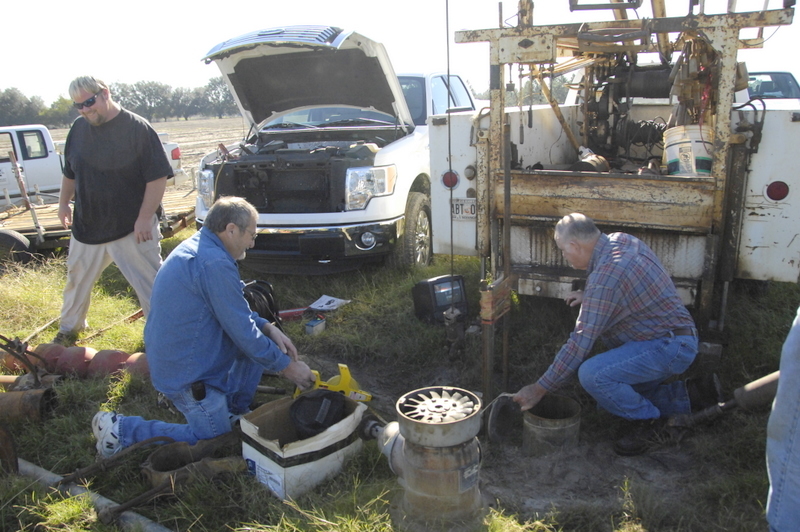 Sometimes some parts have fallen into the well so we need to see how best to get them out. We looked into one well recently that was pumping sand and discovered that the caseing wasn’t sealed into the limestone very well and found how much further caseing need to go for a proper seal. It’s amazing to me everytime how the limestone aquifer looks with all the cracks and crevises and holes that water meanders through in the Floridan aquifer. We are very fortunate and blessed to be in an area where the limestone is very thick and has a great recharge capacity. 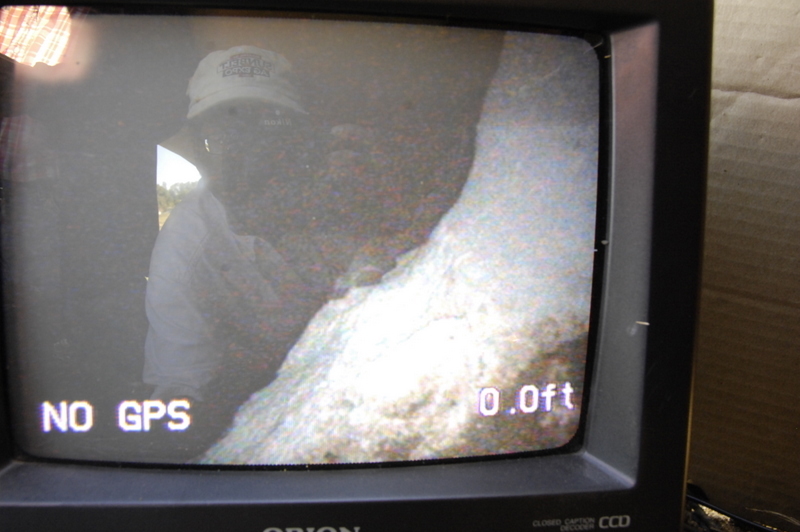 Here’s a couple of photos of the limestone sides of the well down below the metal pipe caseing. 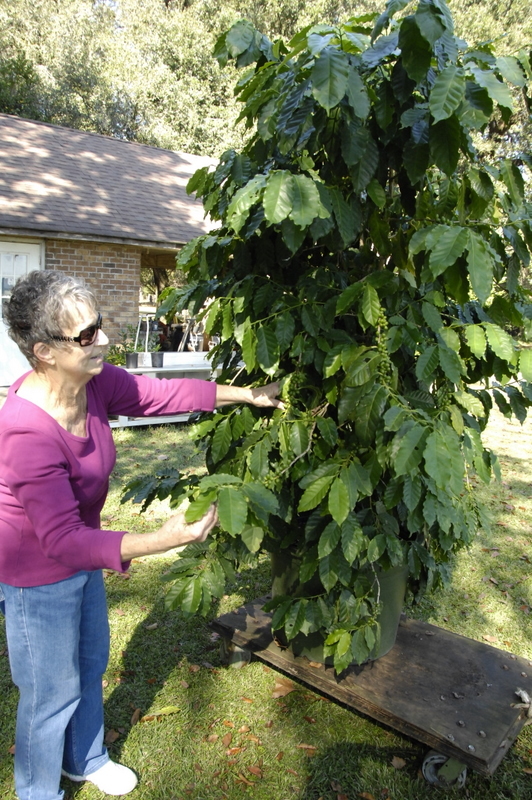 Lamar Cobb showed me this coffee tree he grew about 10 years ago, so I was surprised when last week Mrs Joan called to tell me that they still have it and it’s doing well. It has a good many beans on it that will be ripe before long. Of course coffee is a tropical crop but Lamar takes good care of this tree , taking it inside when it gets very cold. You cam see that it’s on wheels. Mrs Joan says they hope to harvest these beans and roast them for coffee this year. Coffee is usually grown under shaded conditions but may be grown in full sun. Optimum growing conditions include temperatures from 59 to 75°F , high humidity, and protection from windy conditions. 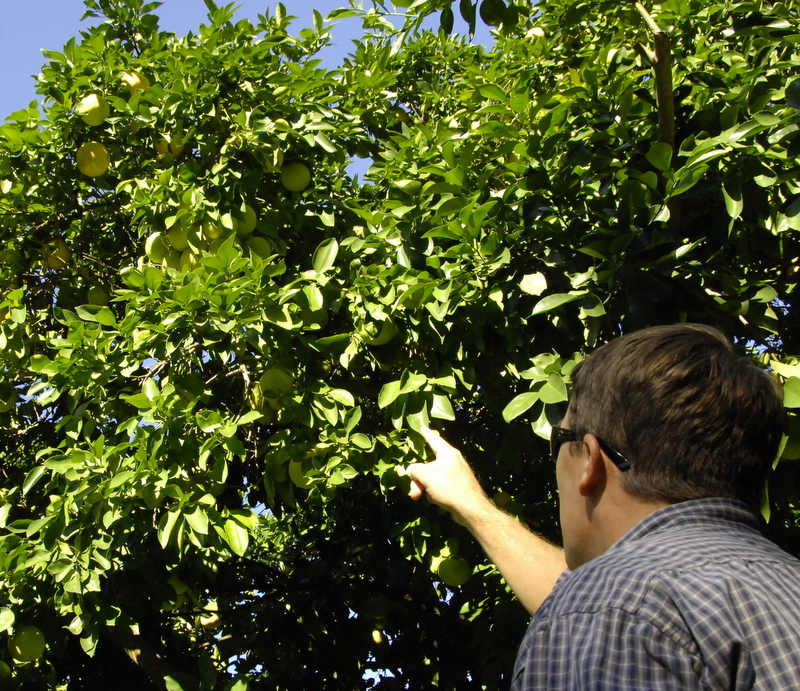 Temperatures above 77°F slow growth, and leaves are damaged at temperatures above 86°F . Constant, large fluctuations in daily temperatures, and constant temperatures at or below 41°F may cause leaf drop and tree decline. 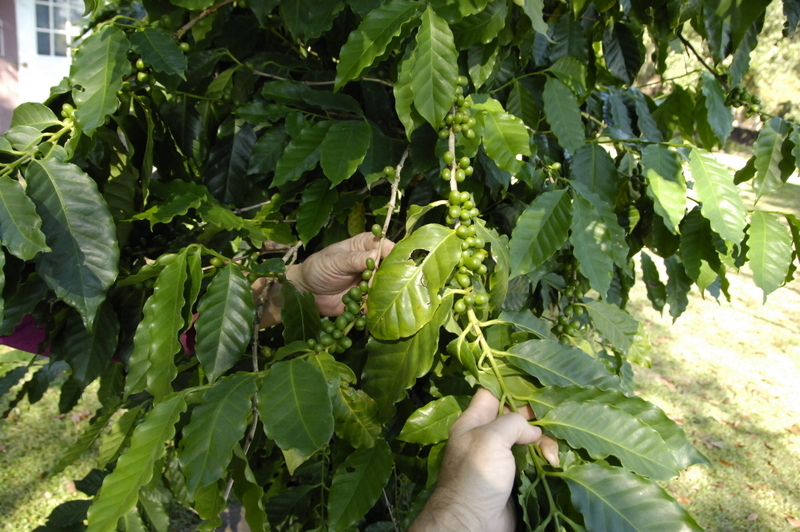 Coffee plants may be damaged or killed by freezing temperatures. In the tropics or warm subtropics, coffee is grown at high altitudes (up to about 3,500 ft; 1,100 m) where temperatures are moderate and never freezing. Coffee is generally harvested when the berry turns from green to red. The berries should be picked, then washed in clean water (good berries sink), and then the outer pulp, should be removed. The cleaned beans should then be placed a container filled with water and allowed to ferment for 24 hours and then washed clean and dried. Drying can be done by spreading the beans out on paper and placing them in the sun. Once dry, the outer bean layer, called a hull, may be removed by rubbing. Finally, the dried, cleaned beans may be lightly roasted (turning them often). Properly roasting the beans is considered an art. Roasting develops the ultimate flavor, aroma, and quality of the coffee produced. After cooling, dried beans may be stored for weeks in a cool, dry storage area or the refrigerator. According to a coffee historylegend, an Arabian shepherd named Kaldi found his goats dancing joyously around a dark green leafed shrub with bright red cherries in the southern tip of the Arabian Peninsula. Kaldi soon determined that it was the bright red cherries on the shrub that were causing the peculiar euphoria and after trying the cherries himself, he learned of their powerful effect. The stimulating effect was then exploited by monks at a local monastery to stay awake during extended hours of prayer and distributed to other monasteries around the world. Coffee was born. For more coffee legends and details about the history of the coffee bean, visit National Geographic.com. Folks have been asking me about our local sweet potatoes and yes they are ready. here’s Yancey Trawick with a couple of types they have that they’ll be digging on Saturday mornings. Just go down highway 39 past the country club to Buckhole Road and take a left and look for signs. I’ve heard from some folks that got some last week that say they are very good. 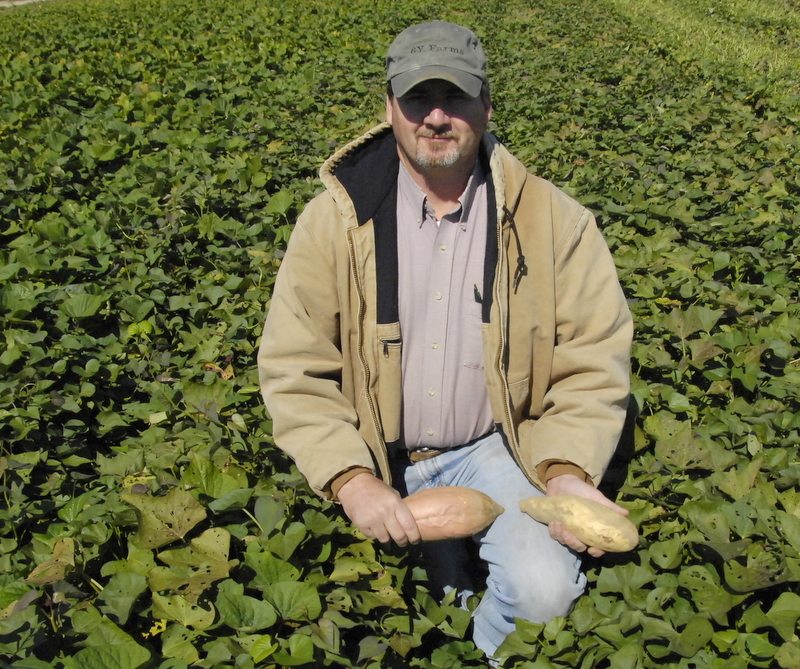 Here’s a link to a good UGA publication concerning curing and storing sweet potatoes. Here’s a video of Yancey digging some sweet potatoes this past saturday. 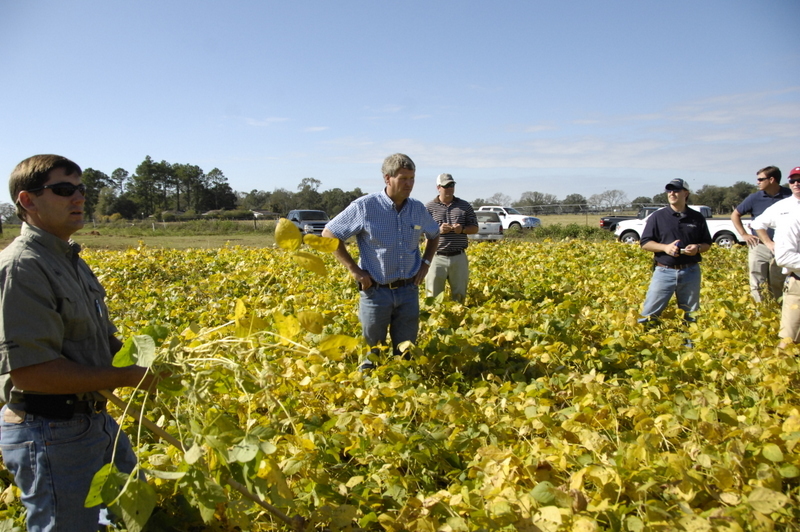 Recently we had an ultra late soybean tour and meeting here in Seminole County. We saw 5 varieties that are looking very good at this point and discussed the best way to make this process work. 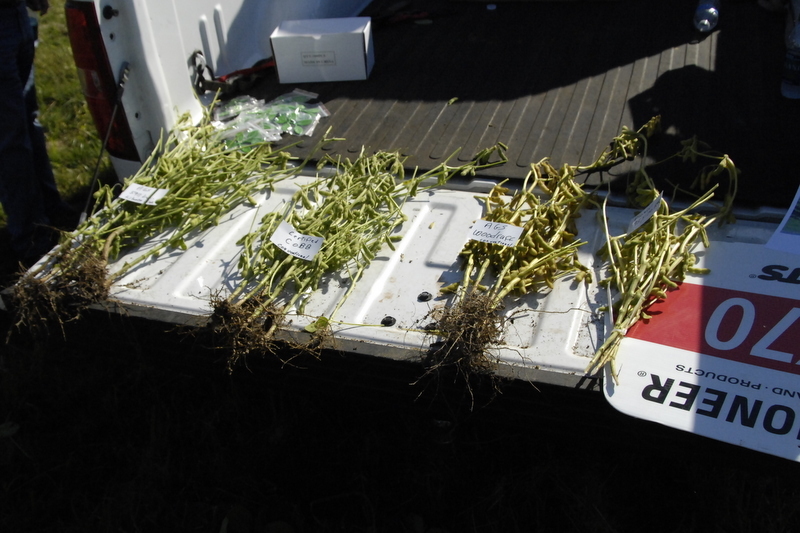 Here’s a link to a video of our powerpoint pesentation about how to do well with soybeans after field corn. Click on the small photo. Getting the right variety is very important. You want a variety that will get tall enough. What you can use willl vary depending on the planting date. As you can see below , we have leaf yellowing and leaf drop on one soybean variety but the other variety will take a little longer, due to maturity differences. Local growers shared their experiences in growing soybeans after corn. These soybeans at bottom were planted about July 22 and are about mature now. Ultra late corn is progressing as this field is now beginning to dent. So, it will start to form black layer in about 10 days. 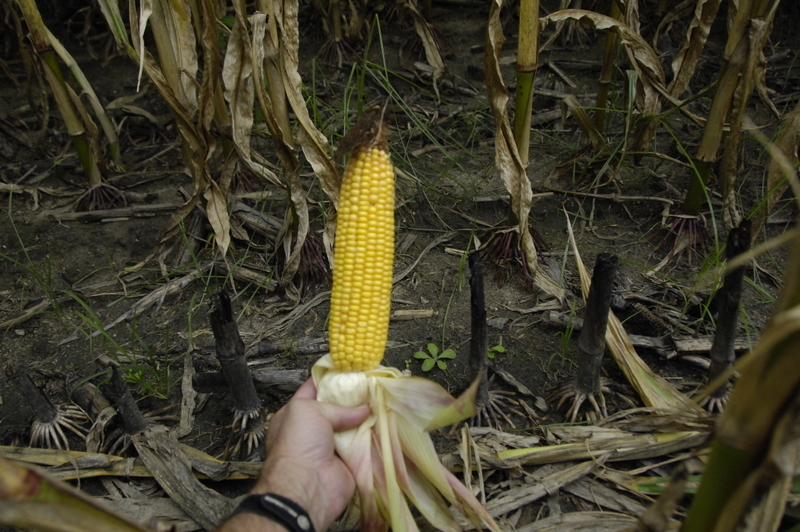 This second crop corn was planted on July 22. 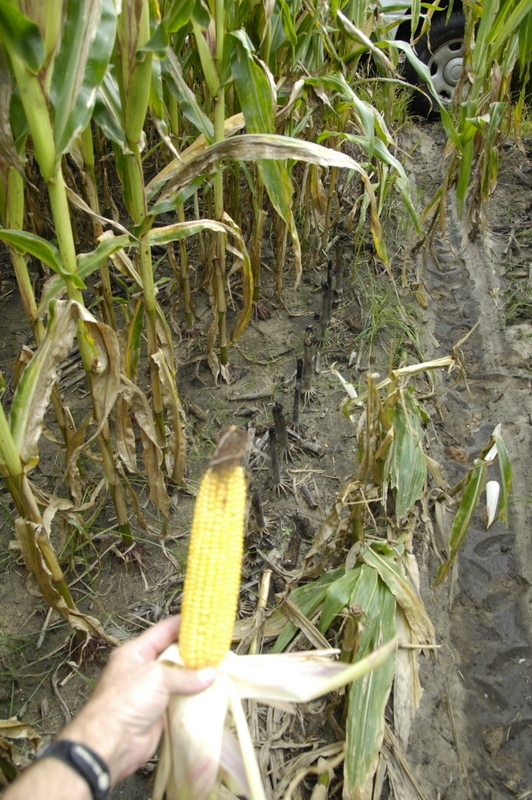 This is disease resistant corn but it has been sprayed 3 times with fungicide due to disease pressure. We estimate the yield here at about 110 bushel per acre. The first crop of corn yielded 260 bushels per acre. You can see the old stalks from the first crop in these photos I took yesterday. There’s a lot of cotton that is ready to pick as recent rains have slowed down picking. Also more cotton is being sprayed to take the leaves off and pop open bolls. 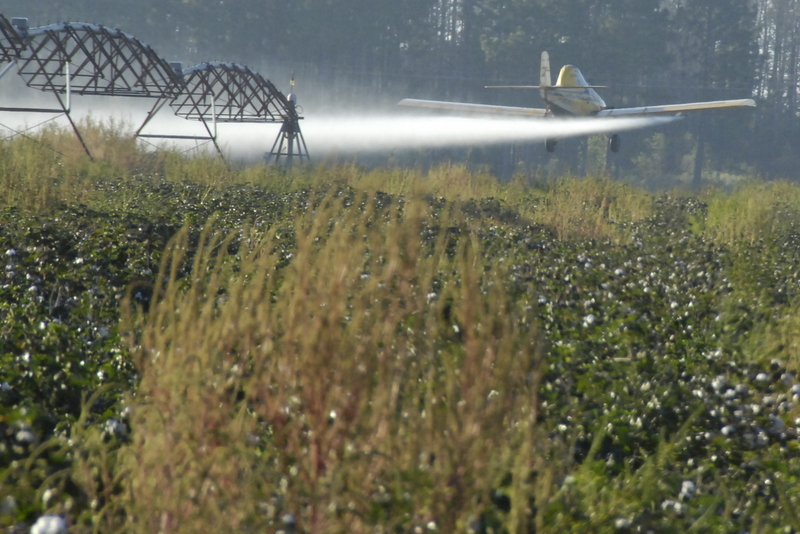 Here’s a brave pilot spraying defoliant on a cotton field. recent windy weather has made spraying very challenging. Here’s a pigweedy cotton field being defoliated. In fields like this we need a good plan for pigweed control next year as there will be millions of seed out there. Yes, last week I had a photo of a red fox, Vulpes vulpes. They are becoming more common to see in south Georgia. Previously we saw mainly the native gray foxes. The Red Fox was brought in by european settlers. Here is a link below to a good 1 page factsheet about foxes in Georgia, I have an excerpt from it here. 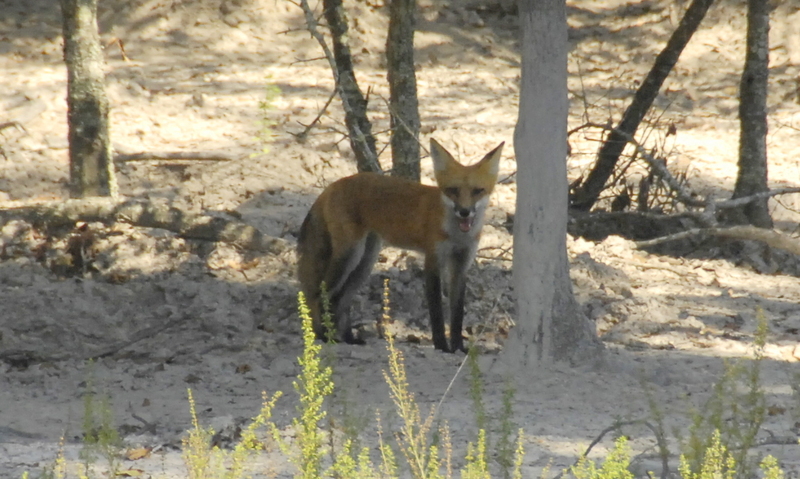 Here’s another shot of the same fox I saw on Fennell Road in southern Seminole County. This week’s question is a test of your being able to see through the natural camoflage to identify what’s in the photo I took on the way to a field of late planted corn. 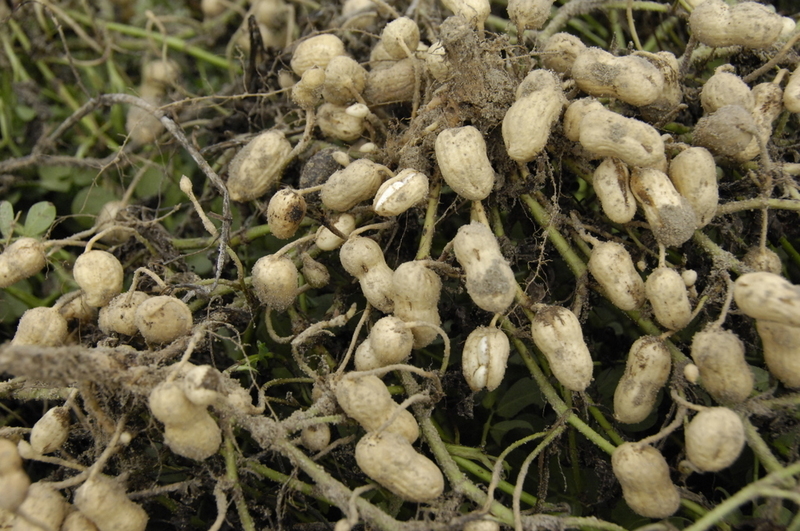 It was a challenging but good peanut season here and most irrigated and some dryland yields are good and we are thankful. Seminole County celebrated the Harvest Festival this past weekend. 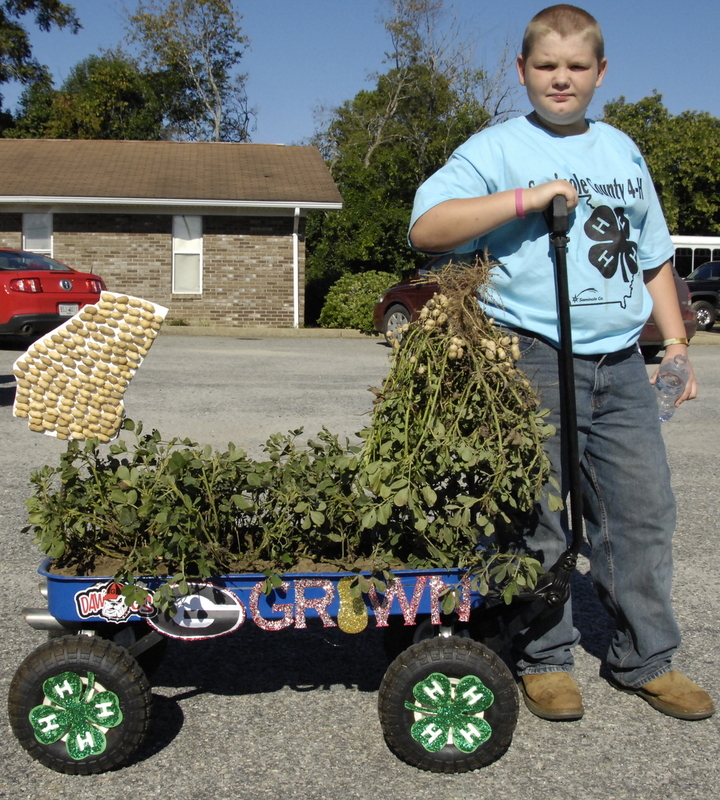 Here’s Cody Shattles, with his 4-H entry in the Seminole County Harvest Festival Parade, promoting Georgia Grown Peanuts. Here are some 155 day old dryland peanuts that are just being dug. Notice they split peanuts we sometimes see on stressed dry peanuts and then they get a couple of big rains and the kernel splits the pod. 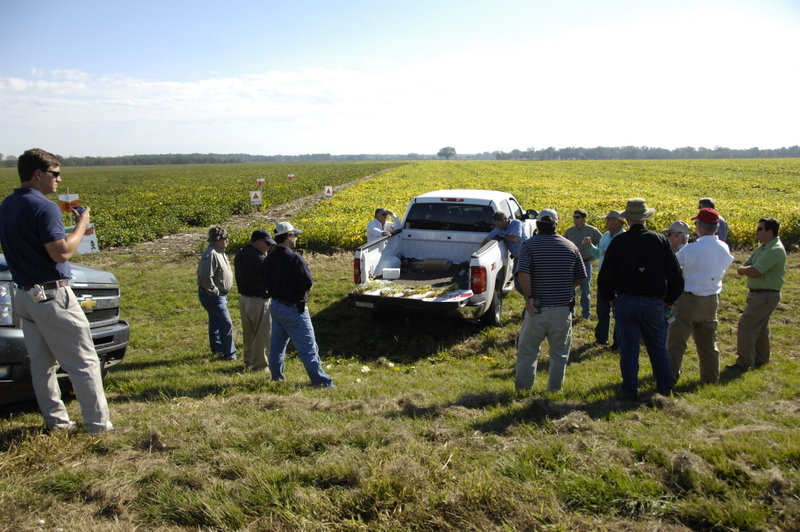 On next Thursday, Oct 27, 2011, we will have an ultra late soybeans field tour where we will look at some different varieties of soybeans planted after corn harvest, generally July 23 to August 3rd or so. We will also discuss the ins and outs of late season production of soybeans in south Georgia. We’ll meet at the Thompson’s Shop on Hebrew road, south of Donalsonville, Georgia at 10:45 am, we’ll look at some of the soybeans in the field and travel to look at some on the Mims Farm as well. Then we’ll go to our Adult learning center on Frendship Ave in Donalsonville for lunch and for some additional information after lunch. Please let us know if you’re coming so we can plan for the meal. 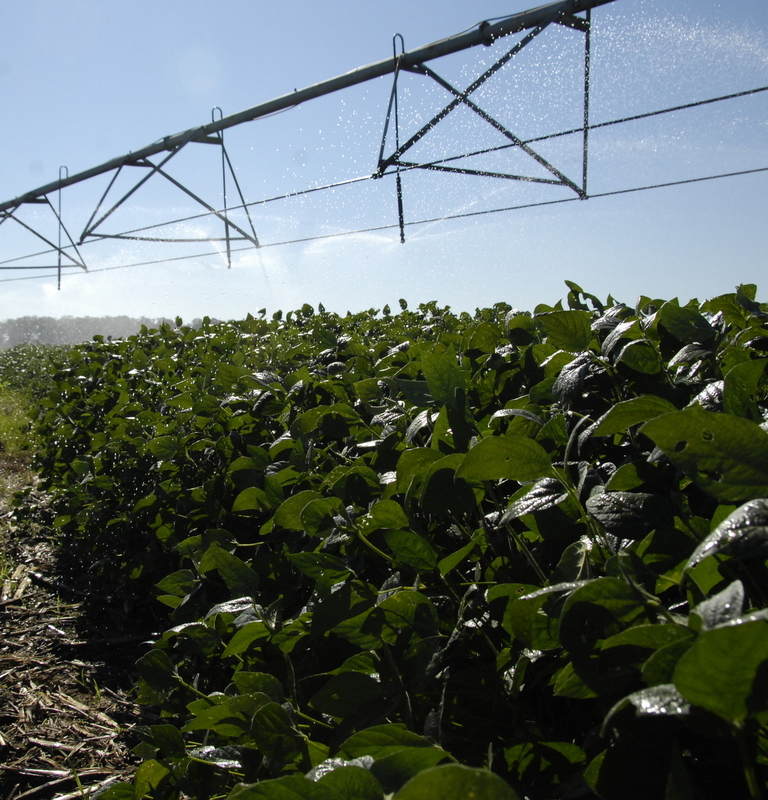 Here are some ultra planted soybeans being watered last week. They look good , if we'll have a few more weeks of good weather they'll yield well.